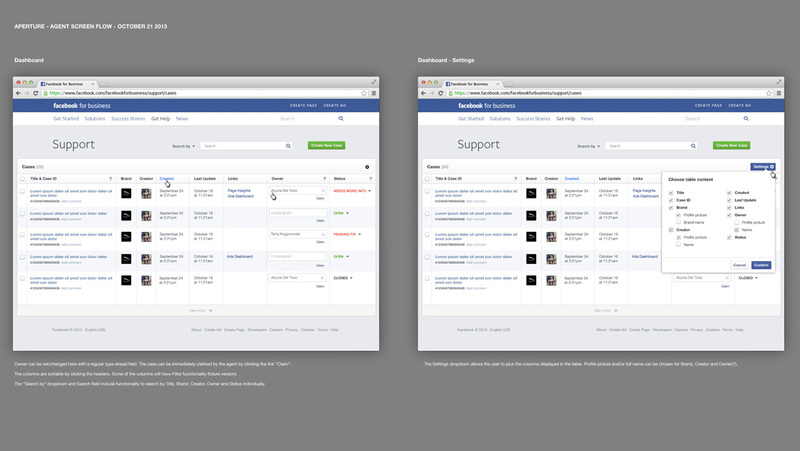 Facebook's internal engineering teams build enterprise tools for the sales teams and other employees of Facebook. Enterprise Engineering and the GMS (Global Marketing Solutions) team work tirelessly to develop products that aid the employees in getting their jobs done effectively and efficiently. Facebook is a very engineering-based company, so when Ylva Wickberg was brought on to the GMS (Global Marketing Solutions) team as a contractor in April, 2013, it was the first time this internal engineering team had worked with a designer. 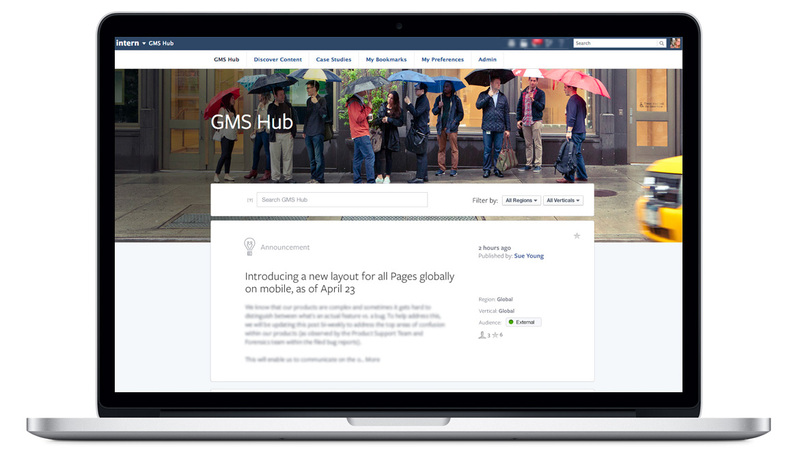 GMS Hub: The first task was to tweak the look and feel of GMS Hub, a brand new knowledge base portal for all announcements, documentation and case studies that the sales team needs to be made aware of on a regular basis. Before GMS Hub, there were big issues in finding existing documentation, since it was scattered throughout the organization. GMS Hub organizes everything in one place, and makes things easy to find. Ylva redesigned the tool and put the new design in place with CSS. 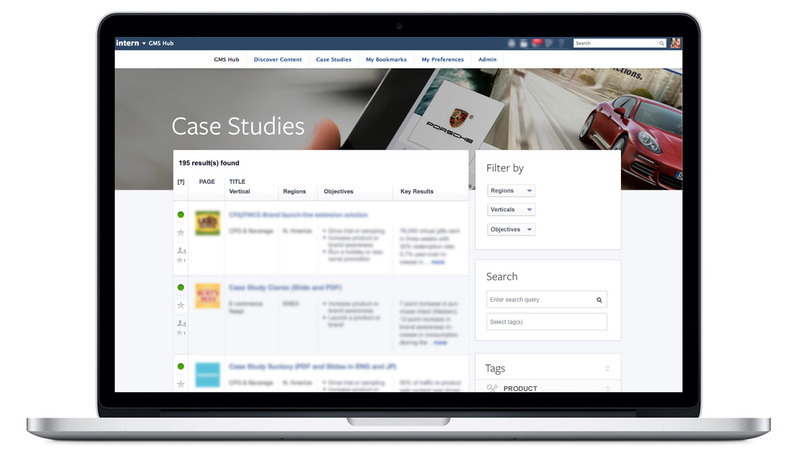 When GMS Hub was announced at the GMS Summit in May 2013, it was met with cheers for the usability of the new tool, and excitement that internal tools were finally being given some design love. Aperture - Facebook for Business: This tool consolidated existing case management tools within Facebook. Ylva redesigned the tool, based on already existing and updated backend. 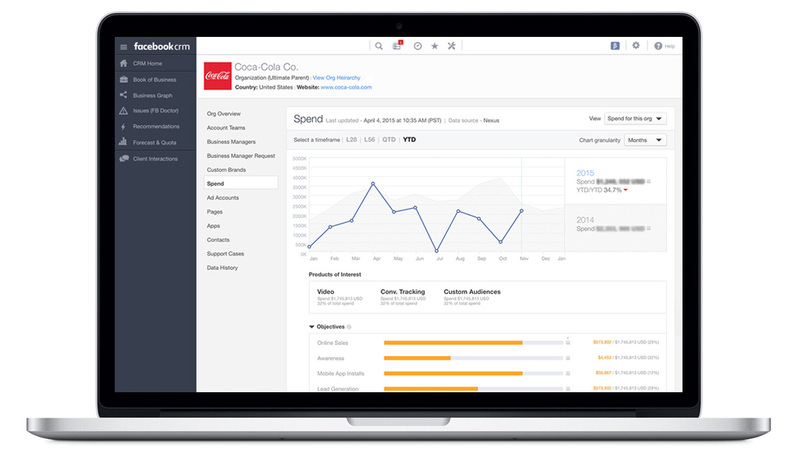 Facebook CRM: The Global Sales and Small to Medium Business sales teams at Facebook had been using Salesforce, and some internally built tools, to keep track of adverstising spend and customer relationships. 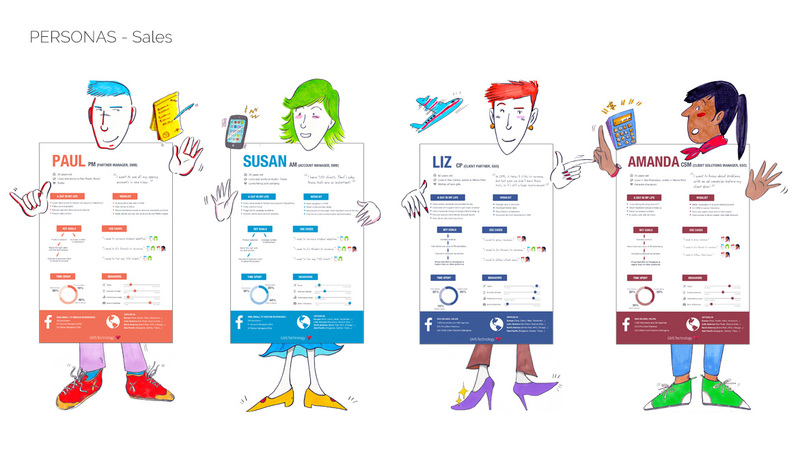 In early 2013, the idea to create an in-house tool was born, based on the extensive information Facebook already possessed about their clients through the Facebook graph. 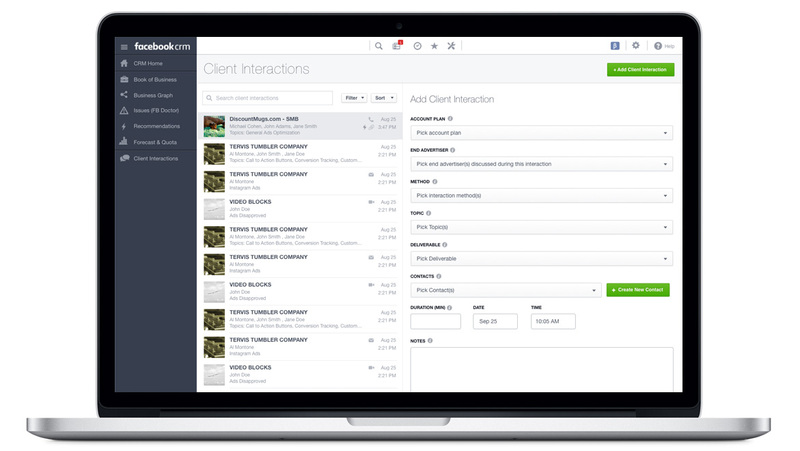 Facebook CRM was created, a completely custom-built Customer Relationship Management tool. Still the only designer on the team, Ylva set out to give the new product an easy-to-use interface and a look that emulated Facebook for Business and public-facing Facebook. 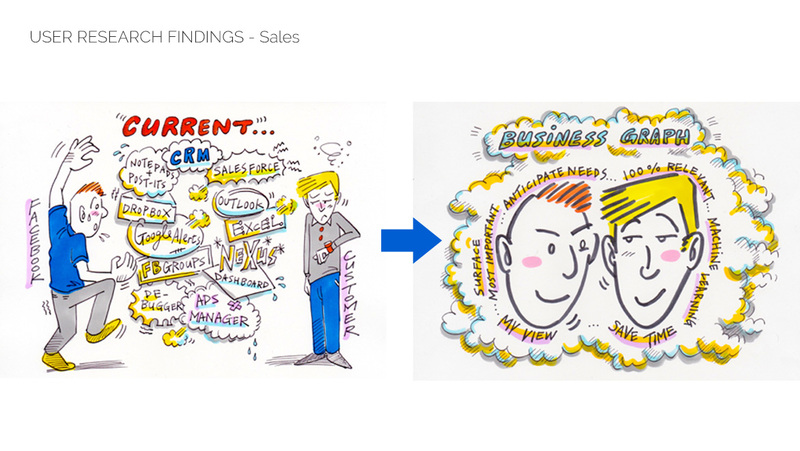 As Facebook CRM garnered traction, user research and shadowing of sales people became more and more important. 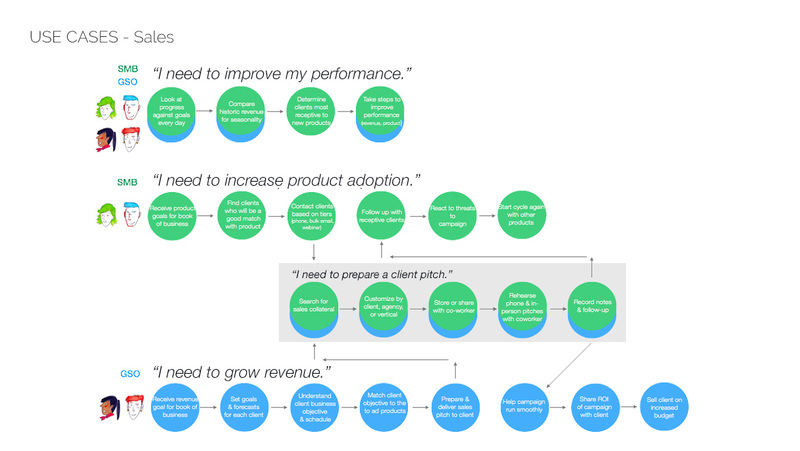 To guide the iterative design and development process, personas, use cases and prototypes were created, based on extensive user interviews in Austin, TX and New York, NY. In May 2014, after a year of contracting, Ylva was hired as the first full-time designer on GMS Tech and Enterprise Engineering at Facebook. The design team urgently needed to be expanded, so Ylva hired and managed a team of UX and UI designers to help with the more than 30 projects the team was now responsible for. Ylva helped set the foundation for product design in the newly formed Enterprise Engineering department and had a big influence on starting a community of Internal Product Designers working on internal-focused applications within Facebook. I had the privilege of working with Ylva during my time at Facebook. She was the first person hired as a full time designer for our internal tools teams. Her design sense was instrumental in the success of a number of our projects most notably Facebook CRM. One of her biggest strengths is the ability to work in a fast-paced engineering environment. I look forward to working with her again one day. I worked closely with Ylva on various products that were aimed at making our Small Medium Business team more successful. She is an excellent UI Designer with years of experience in designing and developing enterprise and consumer-facing products. Ylva is empathetic towards the end-user and is a strong advocate for them. She is also a great team player, when we were resource constrained she played the Product Manager role and UX researcher. Ylva is a fantastic UX team leader, and it was a great pleasure to work with her at Facebook last year. I supported her efforts to design internal software to increase the productivity and satisfaction of account representatives who serve Facebook’s advertising clients. Ylva focuses on end users, finds order in complex environments, and unites her teams to radically transform how software is developed and deployed. Ylva’s intelligence, consideration for others, and hard work inspire those around her to perform at their best. Ylva helped set the foundation for product design in GMS Tech and helped design efforts in other areas of Enterprise Engineering. She had a major influence on creating a community of Internal Product Designers working on internal-focused applications within Facebook. Ylva was an excellent manager at Facebook. I was brought on her team to help unify our suite of products, and though it was an overwhelming task, she made sure that I was able to do my job with no distractions and was a good support who helped me clearly visualize my goals. She is also a great collaborator and an excellent designer herself. Not only was she great at completing the immediate task at hand, she was a great visionary that made sure that our products and designs were sustainable for the long term.